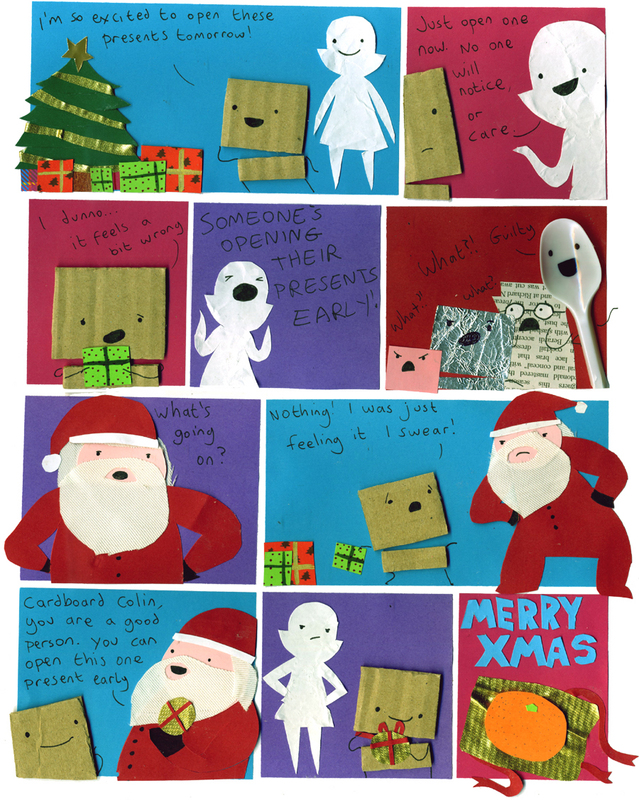 So this is the last My Cardboard Life comic of 2010! I’ll be back with more comics on Monday 3rd January 2011! I hope your seasonal festivities are enjoyable, and that if anyone gives you a satsuma, it’s a sweet one. Aww I'm glad Santa can tell who's actually naughty and who's actually nice – like Colin. D: WHY IS THIS THE LAST COMIC OF 2010!? because they’re having a break until 2011 and rightly so, as tomorrow is christmas day and then the lead up to new years. i’m so glad collin didn’t get the short end of the stick this time! love. very happy xmass for Colin! What is Santa’s beard made of? Its gorgeous! Pauline, thwarted by Santa! Business Pauline will have to work harder at commercializing the holiday. My family always opens one present at Christmas Eve. It’s usually pajamas or a stuff toy. Something that we can go to sleep with. I like how Pauline is a little put off by Colin’s goodness. I hope Pauline’s nicer in 2011 – it should be one of her resolutions! YAY! I was missing Spoon so much! Satsuma? That’s totally an orange. Merry Christmas all!!! I hope you are all doing well in this occasion!!! this comment is extremely late, but, merry christmas! The spoon is so attention-starved that he will plead guilty even when he isn’t. WOOOOO!!! ~(^U^)~ finally caught up! i must say i’m a new but BIG fan of MCL, so witty and charming, i adore it! keep up with the amazing work, hope you had a happy holiday, and best wishes for next year!